McDonald's is adding apples to all its Happy Meals and launching a nutrition-focused mobile phone app as part of a broader health push. The changes underscore how the restaurant industry is reacting to the demands of customers and regulators who blame it for health ills ranging from childhood obesity to diabetes. — McDonald's pledged to reduce sugars, saturated fats and calories through "varied portion sizes, reformulations and innovations" by 2020. It didn't give details. By 2015, it will reduce sodium by 15%. — McDonald's will introduce a new mobile app focused just on nutrition information. — McDonald's USA president Jan Fields and other executives will go on a "listening tour" in August to hear suggestions from parents and nutrition experts. The chain will also launch a new online forum for parents. "We've been in the nutrition game for over 30 years in providing nutrition information to our customers," Goody said. "Now what we're doing is we're adding more food groups and … creating nutritional awareness." 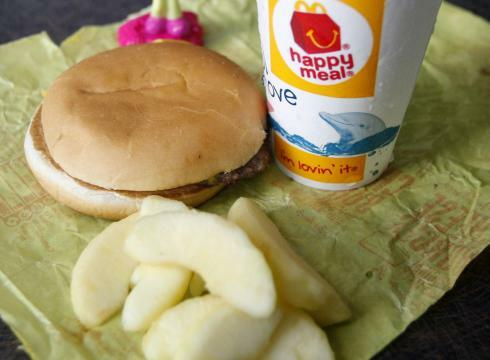 For Happy Meals, U.S. customers can already choose between apples or fries. But only about 11% of customers were ordering apples, the restaurant said. Goody said the change is indicative of "incremental lifestyle modifications." Asked why McDonald's didn't eliminate fries, she said that "all foods fit when consumed in moderation."